When David Ben ­Gurion, the architect and first Prime Minister of Israel, the modern Jewish state, in 1948, he was statesman enough to recognise that there were two competing nationalisms for the land of Palestine, both with valid claims. Why is Netanyahu, the current incumbent, so frightened to admit that plain truth? Is it because his grasp of historical fact is deficient or is it because he revels in political power and deception at the expense of future Jewish generations? Now is already beyond time for a paradigm shift that will consign the repressive, neo-colonial policies of Likud Zionism to the dustbin of the 20th century. A Jewish homeland is one thing: genocide is another and European arms exporters to Israel must take action to avoid becoming potential accessories to criminal activity on a substantial scale. By “genocide” we mean the destruction of an ethnic group…. Generally speaking, genocide does not necessarily mean the immediate destruction of a nation, except when accomplished by mass killings of all members of a nation. It is intended rather to signify a coordinated plan of different actions aiming at the destruction of essential foundations of the life of national groups, with the aim of annihilating the groups themselves. The objectives of such a plan would be disintegration of the political and social institutions, of culture, language, national feelings, religion, and the economic existence of national groups, and the destruction of the personal security, liberty, health, dignity, and even the lives of the individuals belonging to such groups…. 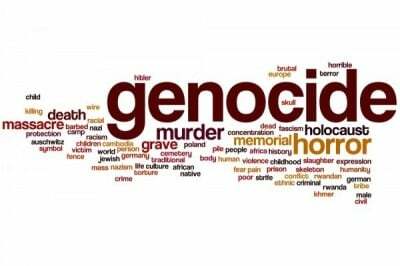 The crime of genocide should be recognized therein as a conspiracy to exterminate national, religious or racial groups. The overt acts of such a conspiracy may consist of attacks against life, liberty or property of members of such groups merely because of their affiliation with such groups. The formulation of the crime may be as follows: “Whoever, while participating in a conspiracy to destroy a national, racial or religious group, undertakes an attack against life, liberty or property of members of such groups is guilty of the crime of genocide.